A tec has concurrent engineering and prototype manufacturing capabilities to expedite development projects. Our experienced staff promotes fabrication feedback. Our team intelligently assists in prototyping, and first article verification making sure the final product can be produced in normal manufacturing environments with minimal custom processing. 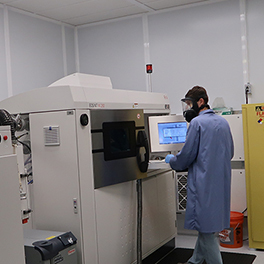 Atec has invested in Additive Manufacturing using 3D metal printing equipment. Our prototype engineering capabilities have afforded Atec the opportunity to participate in the 2GRLV, RL50, RL60, 25RIV and J2x rocket engine development activities. Our AMETS 50 jet engine test stand was similarly developed from early design and prototyping efforts. On our Energy side, prototype/development projects have included improved hangers, MWD tools, CNC wound guidance coils, real time acidizing mixing systems, deep sea solenoids, drilling control systems, and complex mechanical components. Atec, Celtech, Vital Link and Hager Machine & Tool bring the product development expertise on Aerospace & Energy customers’ needs for their equipment.